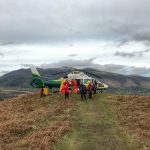 Incident Details: Two walkers on their way down Blencathra, spotted something blue on the lower path further down the fell. As they watched, they saw an arm move, and realised to their horror that it was a man in distress. 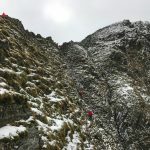 One of them got down to him, and realised that he had fallen some considerable distance from the path above, and had suffered serious head injuries. The Team was alerted, and immediately requested the attendance of an Air Ambulance. Once they were on scene, it was clear that it might be quicker to request a winching helicopter because of the distance to helimed, and the awkward carry. The medical crew from the Air Ambulance, and two of the Team’s paramedics worked together to stabilise the casualty, and he was given anaesthesia to enable him to be flown safely in the helicopter. A decision was taken to cancel the S92, and carry the patient down to helimed. This was achieved successfully and the casualty was then airlifted to Newcastle Victoria Infirmary. 18 Team members – 2 hours 07 minutes.